Imants Leitis is the Founder of BRAININJURYFORUM.com and a brain injury advocate. He has been a caregiver to two severe traumatic brain injury (TBI) and orthopedic survivors since 1997 when a car mounted the sidewalk and ran down his family, leaving one deceased at the scene and two fighting for their lives. His article on the injury that “does not discriminate” looks at the impact acquired brain injury (ABI) can have on the loved ones of a brain injury survivor. We hear about brain injuries occurring in sports, from motor vehicle accidents and other recreational activities; however few have stopped to imagine that “A Brain Injury Does Not Discriminate” and that one could happen to anyone or someone we love. A brain injury changes a family’s functionality, its balance, dynamic, harmony and landscape. When it comes to brain injury, there is a loss. Although you may not have lost anyone in the physical sense, in many scenarios families have lost the person they once knew. Losing someone you care for is difficult and painful. However, when it comes to brain injury, families live with a reminder of that loss each day, which can make it even more difficult for some. Support for families who live with, care for, and provide structure and support to a survivor is an area that is overlooked and needing more attention across the country. Traumatic Brain Injury (TBI) is responsible for more trauma deaths than to any other region of the body, accounting for 50 per cent or more of all trauma deaths in Canada. 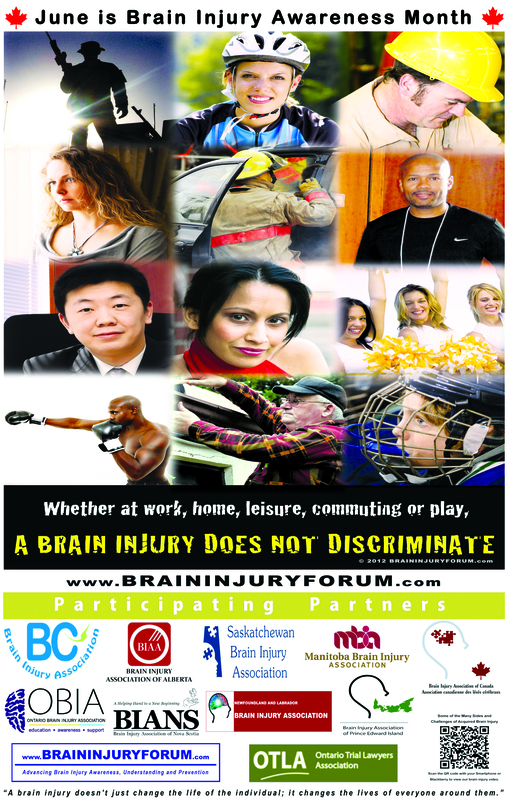 Brain Injury is the number one killer and disabler of people under the age of 44. Statistics further indicate that incidences are two times greater within the male population. The effects of a brain injury on a person’s health and well-being vary significantly and are just beginning to be better understood. The individual effects of a traumatic brain injury can be difficult to predict but it is clear that traumatic brain injuries can have a devastating impact on the quality of life and mind of survivors and family members. Statistics above are from the O.B.I.A. website. When we hear those impactful and crushing words that someone we love has sustained a TBI; we are shocked, hoping for the best for the individual. Those words alone are catastrophic and will cut deep into ones smoothly-shaped world and life. However, after life-saving medical intervention, this is only the beginning of a long process of recovery and a journey that can take a lifetime to navigate and manage. The next leg of one’s recovery journey is difficult and cannot be done alone. Survivors need and require a variation and/or levels of support(s) and systems in place to help them gradually and continually move forward. No two brain injuries are alike and no two recoveries will be either. Typically, families are thrust abruptly into the care-giving mode and support roles with little knowledge, training and familiarity of what exactly a brain injury can mean for them and their loved one. There is so much to learn and understand and little time to do it. Family members assume much of the responsibility for supporting the survivor after the injury. There is not only the initial loss (injury), there is the loss of the person you once knew and a lot of feelings that have to be worked through while trying to be strong for your loved one. I suggest you find a very close friend for you to confide in, bounce thoughts off of and to be your support. There is no manual that tells you exactly how to care and/or what to do or not to do. There are no shortcuts, no easy fixes and/or magic solutions. Brain injury recovery takes time and a lot of personal energy to manage as a caregiver. Learn about their brain injury specifics; don’t be afraid to ask questions; never compare one survivor’s recovery to another; have patience; support the benefits of providing a survivor with structure; put yourself in their shoes for a reality check and find a way to move forward; be mindful that a brain injury does not heal like a broken bone. Most importantly, listen and talk with your loved one (survivor) as they can be of great help with recovery and where possible should be included in decisions and choices that will affect them. Gradually and incrementally support and promote their independence where possible and as best as possible. Be realistic, but never give up as some survivors have and can plateau for a while before more progress is noticed again. Care giving should be a labour of love; however it sometimes comes with a lot of pain, frustration, dark days and challenging periods and tears attached. As a caregiver, remember this phrase that I have coined in my upcoming book, Me Time, which means finding a little time periodically for you so that you don’t burn out, or lose your own identity and quality of life. For those who truly give their all, it is far too easy to forget yourself and lose sight of taking care of yourself. BRAININJURYFORUM.com encourages everyone to become more understanding of this invisible and often disabling injury. I additionally encourage children, parents and all others to help prevent this preventable injury this summer and all-year round by wearing protective headgear whenever engaging in sports and various other recreational activities. I encourage all drivers to be alert while sharing the roadways, do not drink and drive and please do not text while driving.